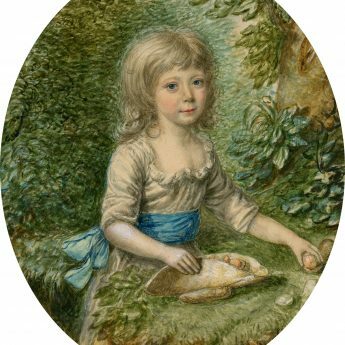 An engaging 18th century watercolour portrait of a little girl named Caroline Elizabeth Letitia Clements pictured in a garden landscape where she is using her straw hat as a receptacle for the fruit she’s gathering. Caroline is wearing a simple white dress with a gathered neckline and a deep blue ribbon sash tied in a bow round her waist. 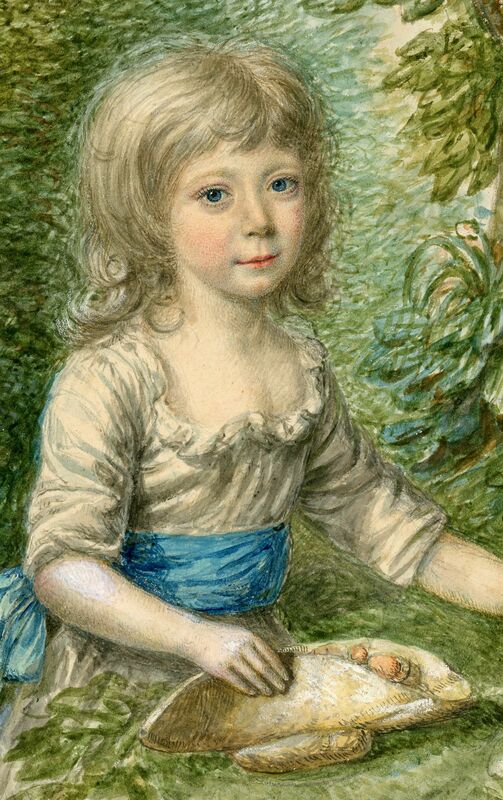 Born in 1781, Caroline was the daughter of Robert Clements, 1st Earl of Leitrim and Lady Elizabeth Skeffington. She married John Thomas Townshend, 2nd Viscount Sydney, as his second wife, in 1802. Sadly she died in childbirth in 1805 when just twenty-four years of age. 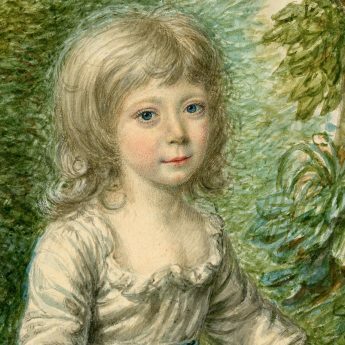 The baby, a boy, survived and grew up to become a Groom-in-Waiting to George IV, a Lord-in-Waiting to William IV, and by the 1880s was Lord Stewart of Queen Victoria’s Household. 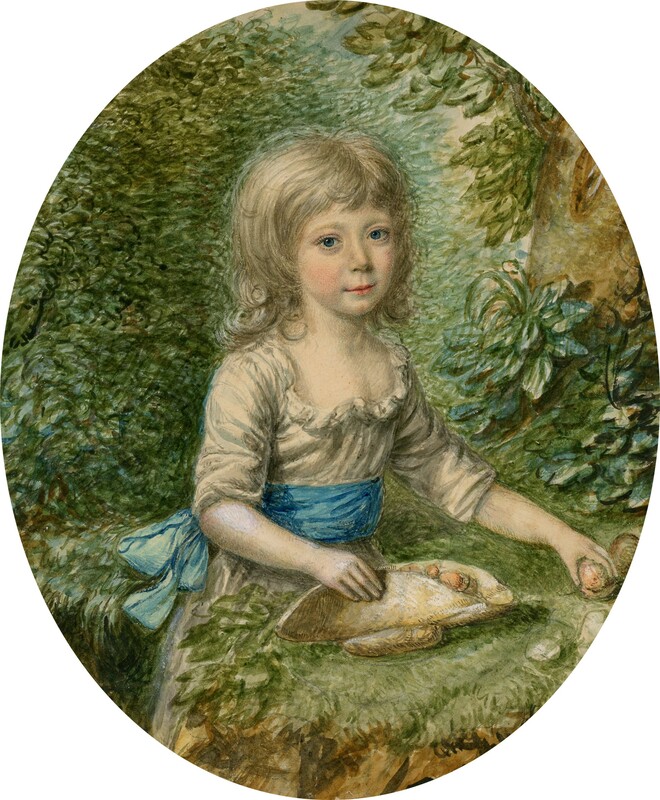 The National Portrait Gallery in London have in their collection a sketch of Caroline taken in 1806 by Henry Bone as a preliminary study for painting a miniature portrait of her in enamel. 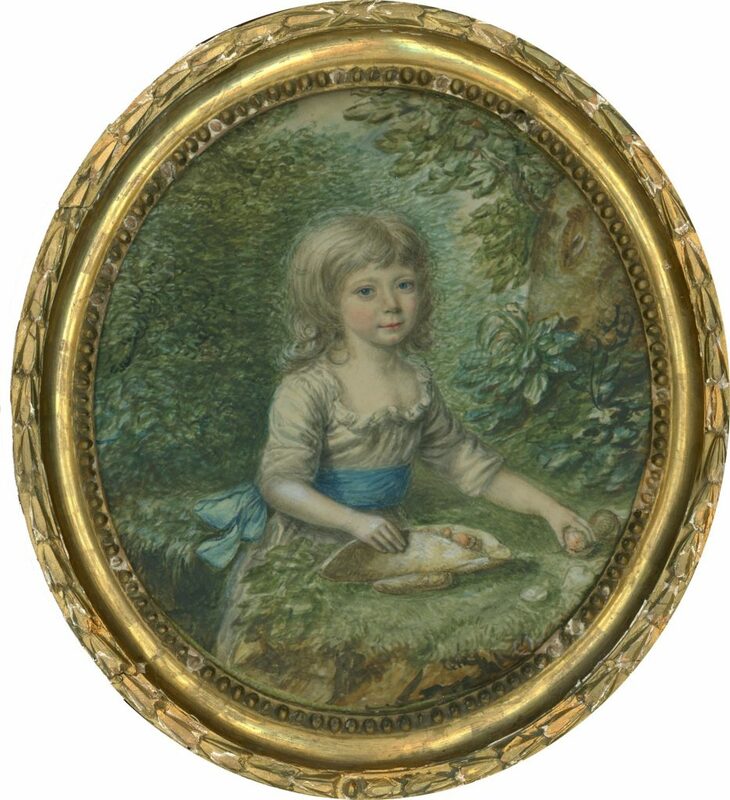 The portrait has a few pin holes along the bottom edge (only visible when using a glass) but is otherwise in fine condition with good colours. It is housed in the original Georgian giltwood frame with decorative borders. The frame has some small losses to the beading but these do not in any way detract from the charm of this piece.